This is a picture of the Aonach Eagach Ridge. One of the best known (especially to adventurous experienced walkers) as the finest mainland scramble in the UK. 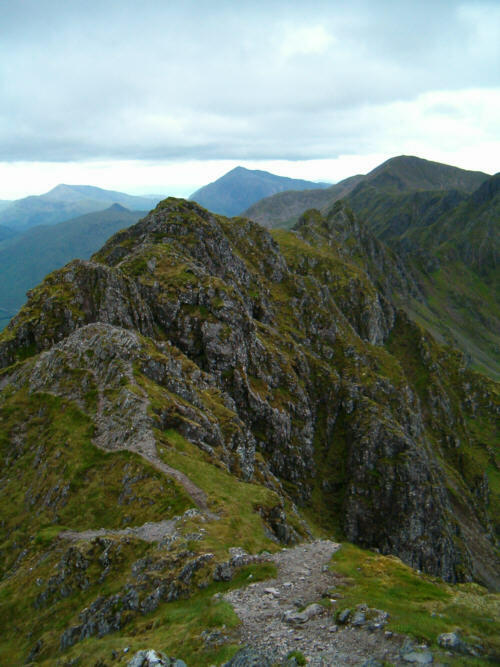 The Aonach Eagach is an extended scramble and includes two of Scotland's trickiest Munro hills, Sgor nam Fiannaidh (996 m) and Meall Dearg (951 m) as part of it. The Aonach Eagach ridge terminates at the Pap of Glencoe (741 m).